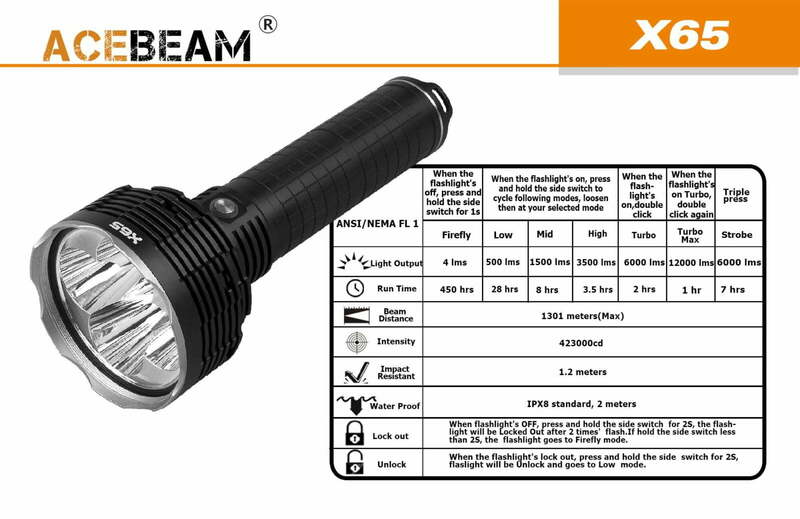 ACEBEAM X65 Flashlight Searchlight 12000 lumens 1301 metres Throw! 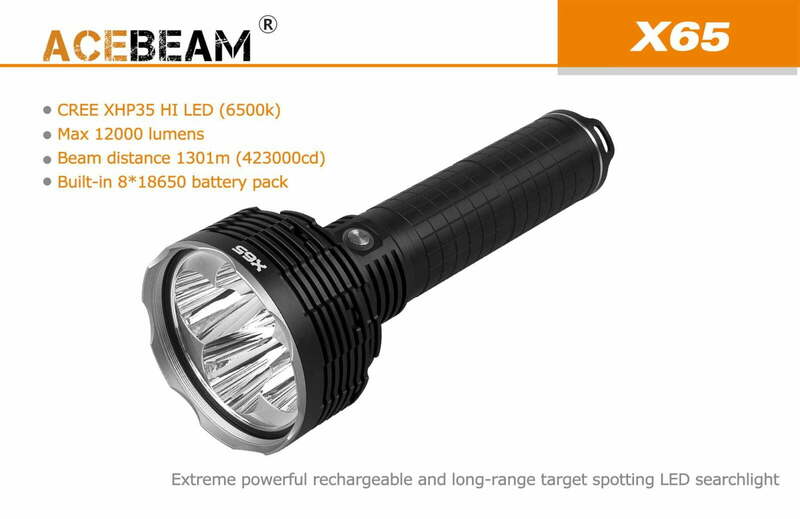 ACEBEAM X65 Flashlight Searchlight 12000 lumens 1301 metres Throw! Home / Stage Lighting / All Disco, Mobile, Stage Lighting / ACEBEAM X65 Flashlight Searchlight 12000 lumens 1301 metres Throw! 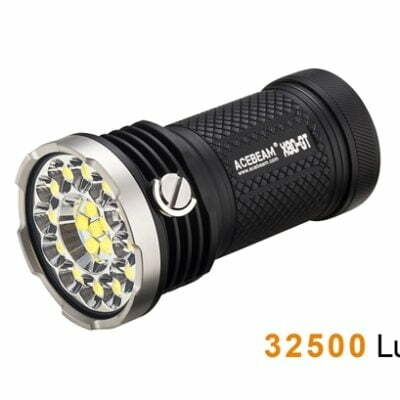 ACEBEAM X65 Flashlight Searchlight; 12000 lumens Throw Distance 1301 metres!! 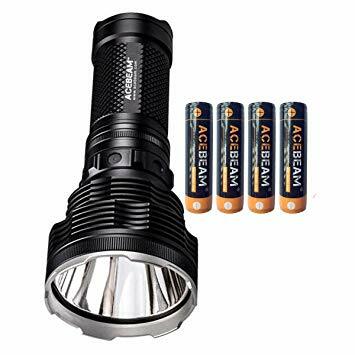 The ACEBEAM X65 Flashlight Searchlight; the world’s most powerful production flashlight delivers the functionality and durability needed by professionals for extreme applications. 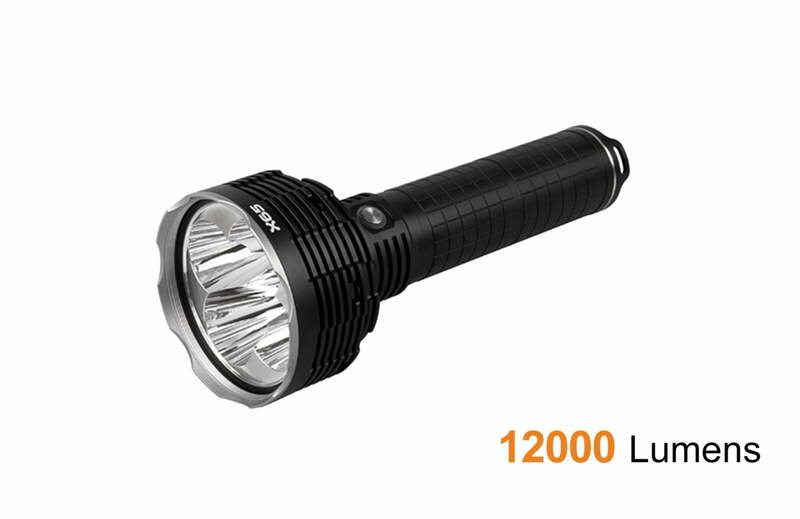 The user-interface is simple and intuitive, providing access to six brightness levels from Ultra-Low (4 lumens) to Turbo-Max (12,000 lumens) and strobe. The X65 is powered for 1 – 450 hours, depending on output, by a custom-built battery pack which can be fully charged in three hours. It is supplied in a presentation case with a universal charger, a strong shoulder strap and spare seals. 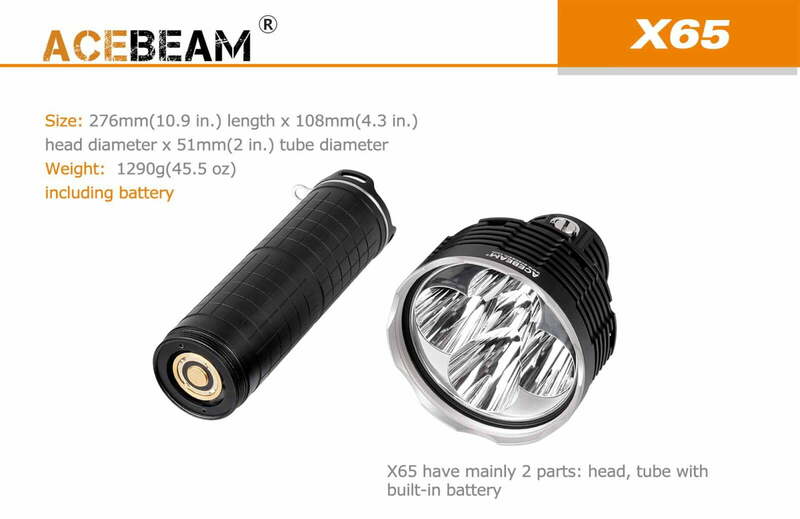 The X65 builds on the success of recent Acebeam models such as the K60, K70 and X60M which have achieved critical acclaim as some of the brightest and best-made LED flashlights on the global market. With the X65, the brief for Acebeam’s engineers was to set a new benchmark for output and beam distance while maintaining the functionality and durability needed by professionals for extreme search-and-rescue, security and hunting applications. 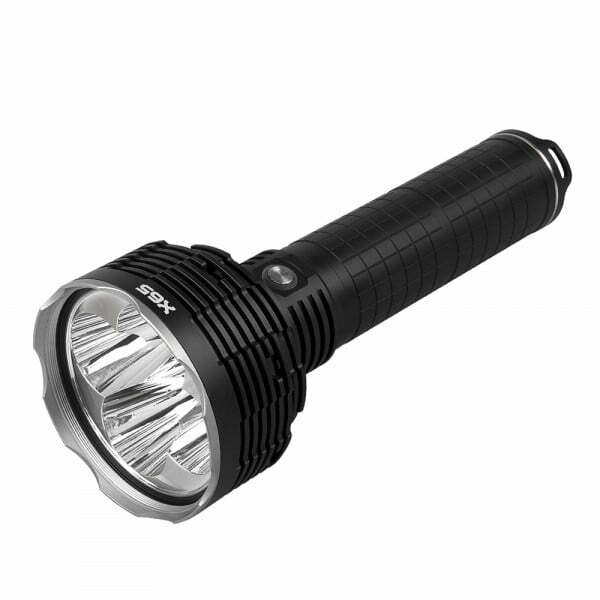 … In response they built the most powerful and robust production flashlight in the world. The X65 is fitted with five CREE XHP35 HI emitters mounted on a red bronze “pill” for efficient heat dissipation; set into an innovative multi-reflector which is optimised for throw and protected from the elements by an AR-coated ultra-clear tempered glass lens and a stainless steel crenellated bezel. 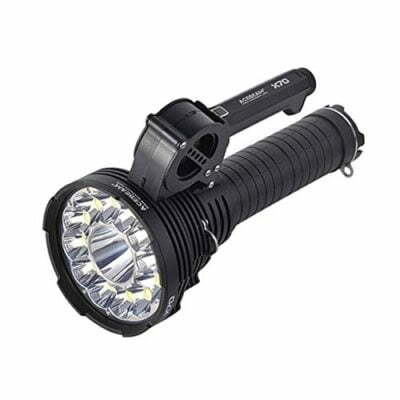 Powered by a custom-made 6,800mAh 14.4V lithium-ion battery pack; the X65 delivers a digitally regulated beam of up to 12,000 out-the-front lumens with an intensity of 423,000 candela. This is equivalent to a throw beam of 1,301 meters using the ANSI formula; for between one hour and 18 days depending on the output selected. The X65 is an extreme tool; designed for extreme conditions. The body is forged from 6063 aluminium alloy; hard-anodised to level 3 (military grade) with an anti-slip finish and sealed to IPX8 standard; for immersion up to 2m and impact resistance up to 1.2m. The user interface is designed to be simple and intuitive under stressful conditions. The X65 is controlled from a single switch which is easy to find in the dark and to operate with either hand. A single click of this switch accesses a previously memorised mode; (Low, Mid or High) while a double click accesses Turbo (6,000 lumens). 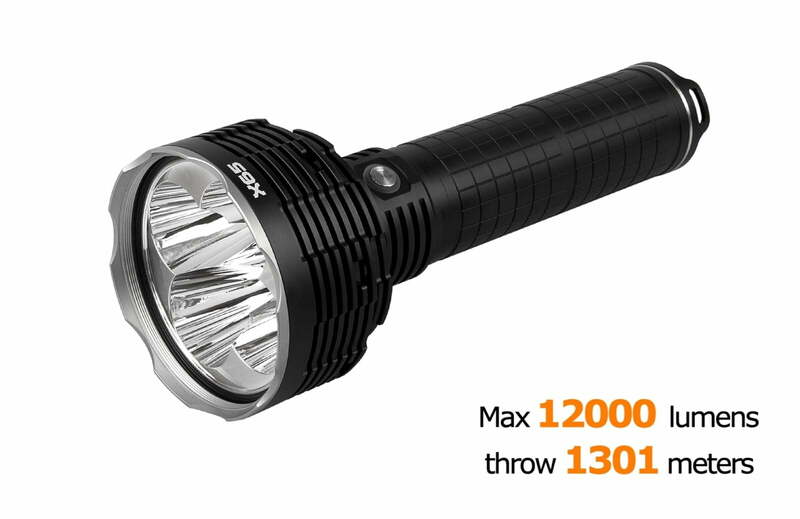 With another double click; Turbo-Max (12,000 lumens). For defensive purposes; or to attract attention; a triple click from any mode or from OFF will trigger a dazzling strobe for up to seven hours! The X65 is supplied with a universal power pack to charge the battery from any AC supply as well as a strong shoulder strap, a spare O-ring and a five-year limited warranty (12 months on the batteries). To charge the battery, connect the supplied universal power pack to a mains supply (110/220v AC). Unscrew the DC Lock cap on the tail-cap and connect the lead from the power pack. A red light on the tail-cap indicates charging in progress, while a green light indicates charging is complete. A full charge will take three hours. 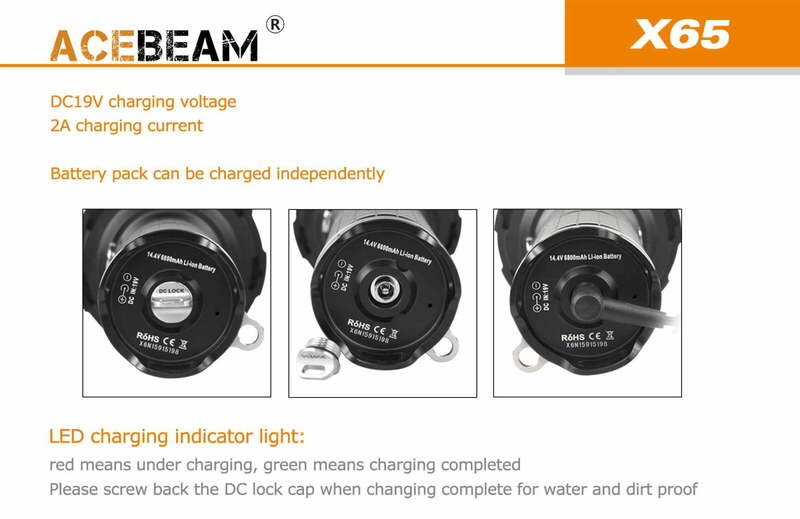 Disconnect the power pack when the green light appears and re-attach the DC Lock cap. Please note that the battery pack can be charged independently of the head. Turn the flashlight ON and OFF by clicking the switch. Press-and-hold the switch to cycle through Low, Mid and High modes. Release the switch to memorise your preferred mode – the light will return to this mode next time the flashlight is turned ON. To access the Ultra-Low mode, press-and-hold the switch from OFF for one second. From Ultra-Low a single click will return the flashlight to the mode memorised in step 3 above. To access the Strobe, triple-click the switch from the ON or OFF position. A single click will return the flashlight to the mode memorised in step 3 above. Note that Turbo, Ultra-Low and Strobe settings are not memorised. To Lock Out the X65 (to prevent accidental activation and depletion of the battery while the flashlight is not in use), press-and-hold the switch from the OFF position for two seconds. The beam will flash twice to indicate successful Lock Out. To Unlock, press and hold the switch for two seconds, until Ultra-Low mode is activated. Note that, during use, the light on the switch indicates the energy remaining in the battery pack. Green = more than 40% reserve; red = less than 40%. The intensity of the beam will reduce when the reserve is under 10%. Please do not disassemble the sealed head – doing so will damage the flashlight and void the warranty. To maintain the IPX8 waterproof rating, please lubricate the rubber O-ring with a silicon grease or other lubricant which is rubber- and aluminium-safe. Note that oil-based lubricants can damage rubber. Please clean the electrical contacts periodically, especially if the beam flickers or fails to light. Use a lint-free cloth or cotton-wool swab dampened with alcohol. If you experience any problems with this product within 15 days of purchase, the dealer will replace it. 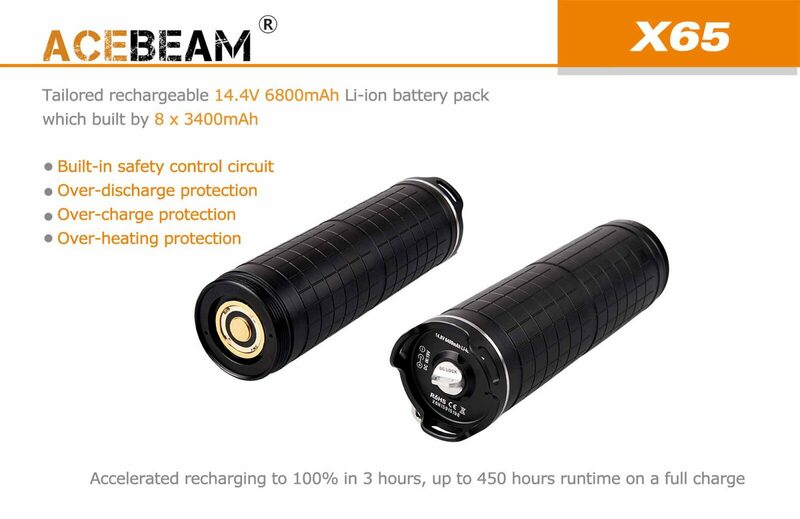 If this flashlight fails to perform as indicated in this manual during normal use within a period of five years (60 months) or the battery fails within 12 months of purchase, the dealer will repair or replace them with the same or similar model. All Acebeam flashlights enjoy a limited lifetime warranty – after 60 months the dealer will attempt to repair the flashlight for the cost of spare parts and shipping (i.e. no charge for labour). 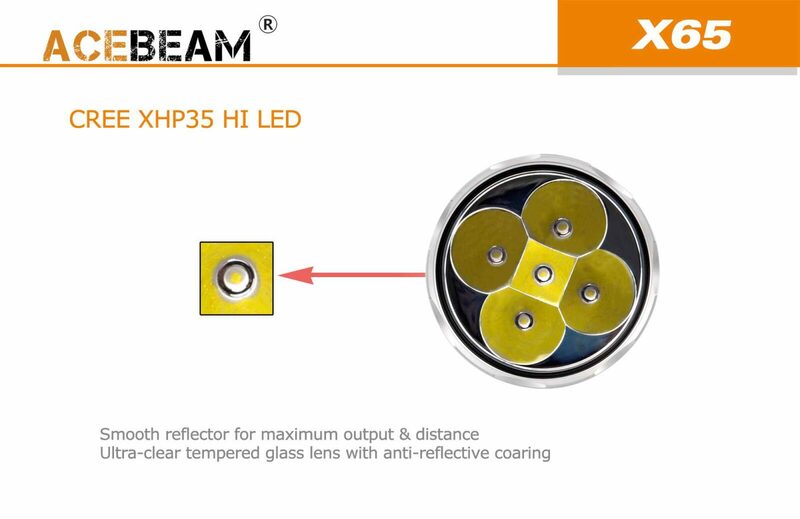 Rough handling or operation which does not comply with this user manual or product specifications; Battery leakage; Unauthorised disassembly, repair or modification; Defects or damaged caused by factors outside of the control of Acebeam. In the event of a claim, please contact Yowcha if purchased from us. You must state that you have a completed Acebeam warranty card, a purchase invoice or receipt and a description of the problem. 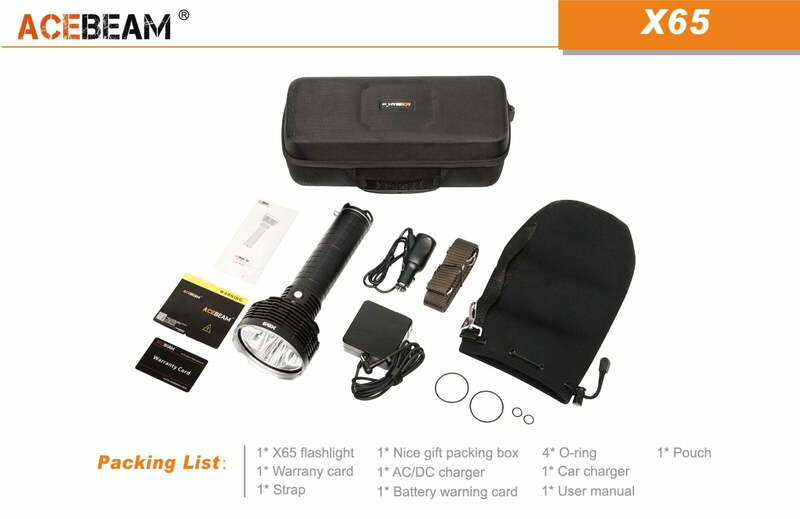 For any Questions about our ACEBEAM X65 Flashlight Searchlight; or for Prices on delivery to the EU please contact us. Or; why not visit our Facebook page and follow us? You can see ALL the latest info as it happens!